Familier esclaircissement de la question si une femme a resté assise au siege papal de Rome entre Leon IV, & Benoist III. Amsterdam, Joan Blaeu, 1649. 8vo. With a woodcut printer's device on title-page. 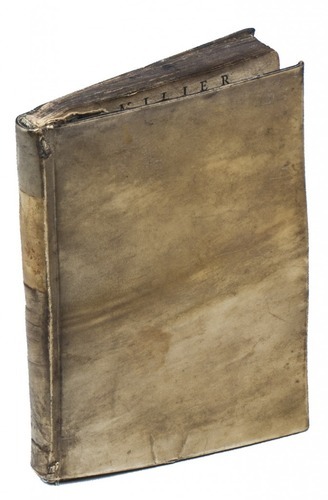 Contemporary limp vellum. 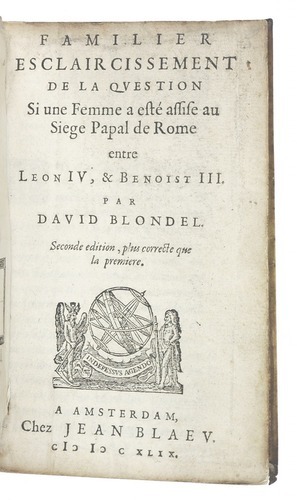 Second edition of a work questioning the existence of the female pope Joan, who supposedly reigned from 855 to 857, written by the French Protestant historian David Blondel (1591-1655). According to the legend, originating from the 13th century, pope Leo IV was succeeded by a talented woman, disguised as a man, who reigned as a pope for two years before her true identity was discovered after she gave birth to a child. Blondel believed the legend to be false, stating that there is no contemporary evidence supporting a female pope and that the chronology of 9th century popes doesn't leave any room for a female pope reigning between Leo IV and his successor Benedict III. With an armorial bookplate on paste-down. Title-page and first few pages slightly soiled at the upper margin, a few minor stains, otherwise in very good condition. Hotchkiss, Clothes make the man: female cross dressing in medieval Europe (2012), p. 162; STCN 089131320.